Thank you to the gorgeous entries this week. Let us say a very big "Thank You" to all our loyal followers & our loyal players who play along with us each week. 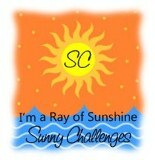 It is very much appreciated that you take the time out to check out our Challenge AND then play along with us. We just love seeing what you create week in & week out! Which is why it gest very difficult to choose just one for our Ray of Sunshine. 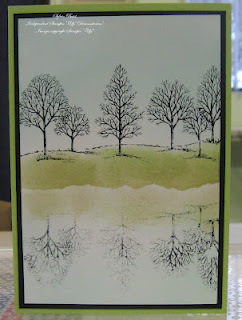 Our Ray of Sunshine goes to Sylvia for her gorgeous card & the use of the Mirror/Reflection Technique...... If you have never tried this technique, give it ago, you will be hooked! We would love for you to pop back tommorw to see what our challenge this week will be. even better, we would love for you to play along with us. Thank you so much. I love playing along with your challenges when I can as I learn so much, and see so many beautiful creations.